Make your pictures look fabulous and funny with this online photo editing websites and apply fancy effects and create real eye-catchers with this collection of easy to use photo effects. All photo tools in this hand-picked collection are browser based, very simple to use and can be combined with each other. 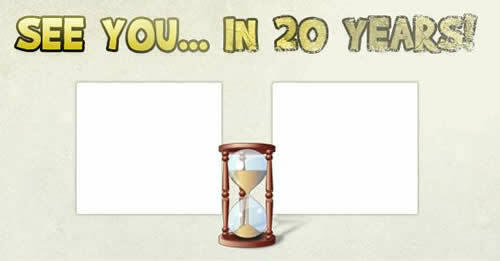 Throughout last year several new fun websites have been released and become popular. After heavy research this is what I could come up with! Enjoy, take a rest and have a fun time! Make your photo funny by placing it in interesting places. 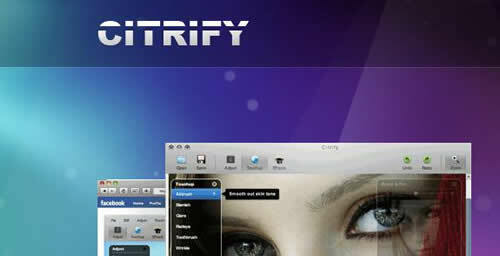 Citrify is the fun little photo editor that runs right in your browser. 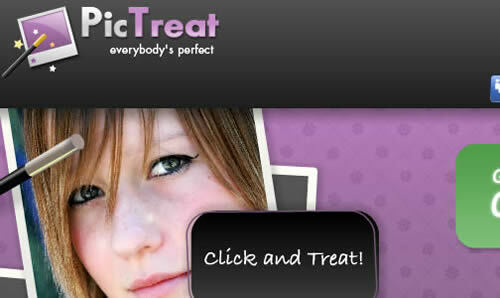 Try out one-click tools for removing pimples, reducing wrinkles, or applying cool effects. Make your face old for FREE. In20years is using advanced face detection and morphing technology to predict what your face would look like in 20 or 30 years from now. Add a shadow to a picture simply in 10 seconds. Could resize picture while adding a shadow, helpful to make cool thumbnail. 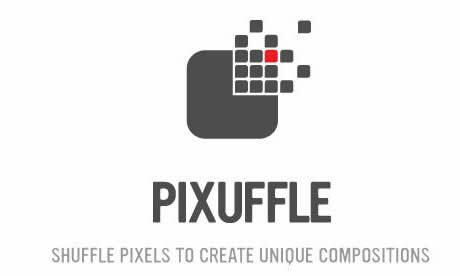 Pixuffle is a free online app that create unique images by shuffling their pixels. It only takes one click to start. The easiest way to remove red-eyes from your photos. Speechable is a free photo service that lets you easily upload photos or pictures and add speech bubbles, captions and doodles to them and share them with friends via email or on Facebook, MySpace, Orkut, blogs, and message boards. No photoshop required! 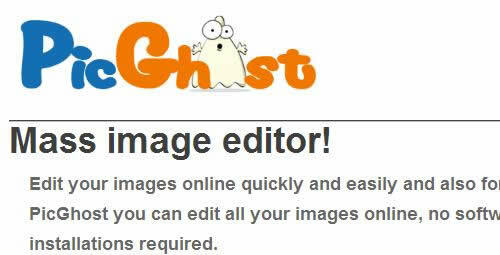 Edit your images online quickly and easily. Select multiple images from your computer or any other online source, and preview in one step. Simply edit your uploaded images by resizing, watermarking and other manipulations. Preview edited images and download them to your computer, or send to any online destination. piZap.com is a free online photo editor that allows you to upload digital photo pictures, add funny graphics, fun easy effects, custom text, paint and then save a web ready JPG to your favorite website or to your computer. With Tatmash.com you can now easily add a tattoo to your photo and see what you’d look like without a tattoo needle even pricking your skin. 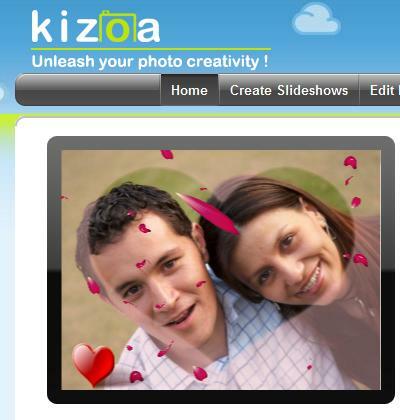 Free service to create slideshows and edit photos with fun effects, animations, music and more. Share your creations on the Internet or burn them to DVD. 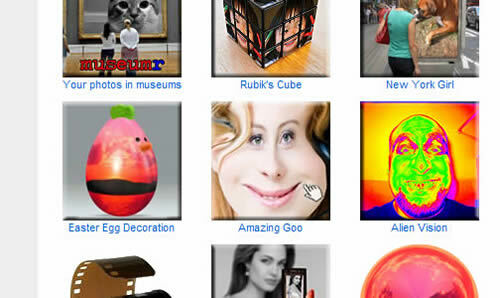 Mugtug is a suite of photo editing software. 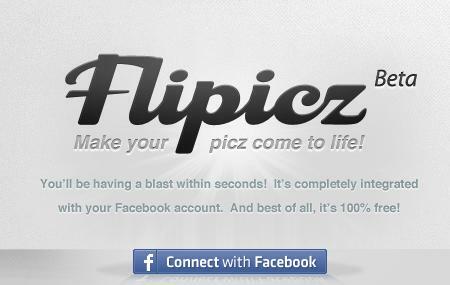 Bring Your Facebook Picz to Life, Two at a Time. 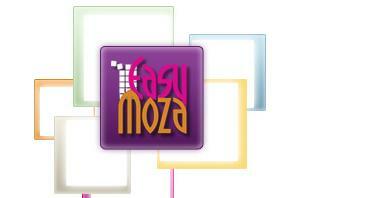 EasyMoza is a web app with which you can easily make your own photo mosaic. If you like the result, it is possible to save your photo mosaic to your computer. 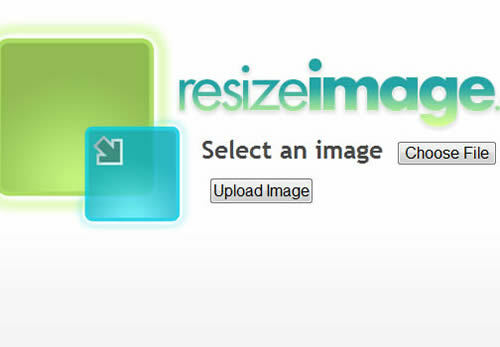 It lets you dynamically resize & improve your images on the fly by just calling a URL. Your own image processing API. Amazifier is the coolest way to make every photo into something amazing. It is all you need, whether you want to just fix little imperfections or create a masterpiece. FotoFuze is a service which lets you enhance photographs and make professional 360 product view photography. Join the Revolution! PhotoFunia is an online free photo editing tool with 100 different effects, that gives you a fun filled experience. You upload any photo and just wait to see the magic. 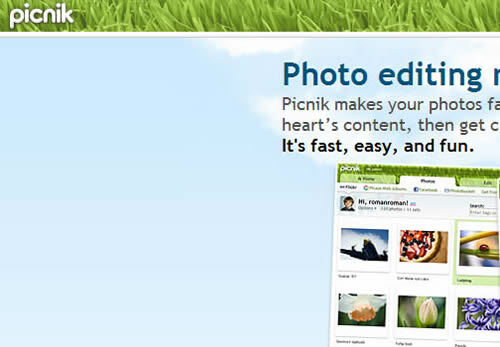 With Picnik you can quickly edit all your online photos from one place. It’s the easiest way on the Web to fix underexposed photos, remove red-eye, or apply effects to your photos. It’s fast, easy, and fun. 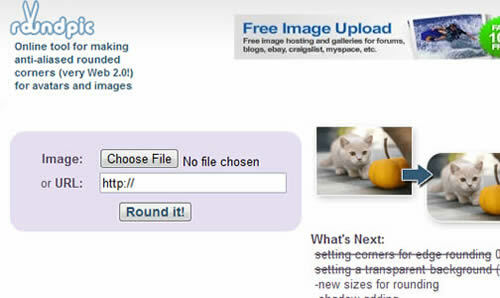 Select an image, upload it, resize or crop images and download it again. 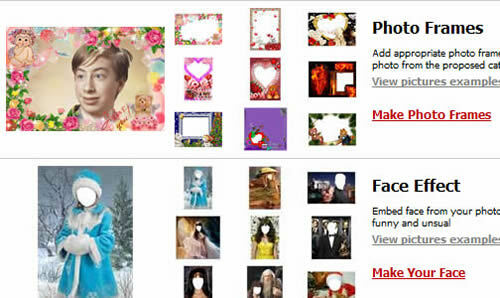 Dumpr is photo editing website where you create marvellous photos to share with your friends. With Snipshot One-click enhance improves, basic editing tools like crop, rotate, resize and basic adjustments like contrast, brightness, saturation, sharpness and hue. 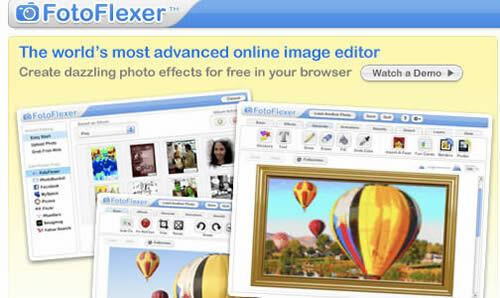 Use FotoFlexer to perform effects previously available only to professionals using expensive software. 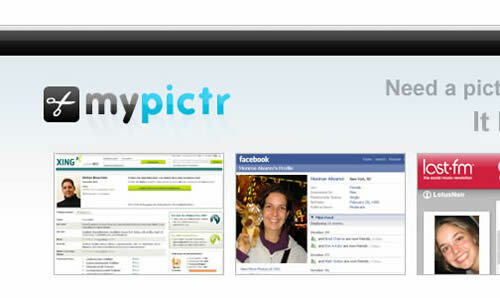 RoundPic is an online tool for making anti-aliased rounded corners (very Web 2.0!) for avatars and images. LoonaPix is another bid to make your pictures look fabulous and funny, all at once. It has launched an image processing service which you can use to add frames to your photos. It’s pretty simple and straightforward to apply. Just upload any photo or select an image from the web (paste the URL in the appropriate area), and choose a frame you like. Free one-click online photo retouching service. Ever want to know what you’d look like in a Fedora? Top Hat? Viking Helmet? Now you can find out without stepping foot into a hat shop. And it’s FREE! 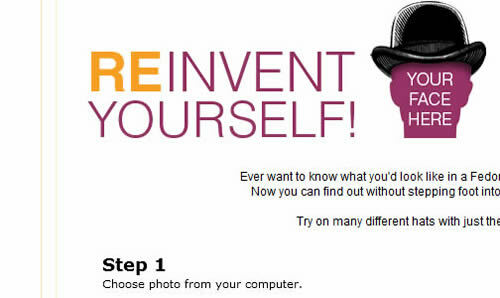 Try on many different hats with just the click of a mouse! 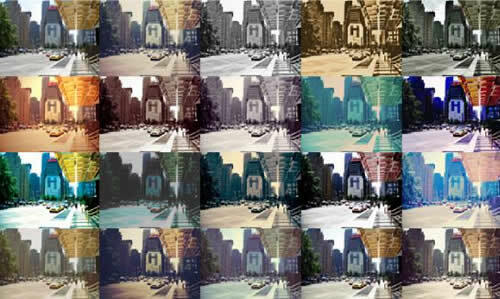 Rollip gives you high quality photo effects, retains original image sizes, 40 filters, completelely online! These look like some fun editing options! Thanks for the great list. I found another good site. Here you can put your photos in the photo frame. Ukarsit your photo. To choose from a huge number of templates. know-how, therefore it’s nice to read this weblog, and I used to visit this webpage everyday. plus theyre a great way to incorporate your color palette. Before you decide on the motif, you have to determine the type of your wedding. Everyday use items like toasters and a microwave can also be a good addition.